One of my favorite parts of being a parent is the bedtime routine. We spend intentional family time together every evening as we put our son to bed. I go to great lengths to be available for this time, which means I shifted my work schedule so that I'm home every evening and if I'm hard at work at home I drop everything I'm doing to participate. It's a source of continuity amidst our chaotic schedule - our son looks forward to it and knows what to expect every time. First is bath time. We don't do that every single night, but when we do it is my special time with him and I cherish it so much (and because I own that time Heather gets a short break from the chaos of the day). 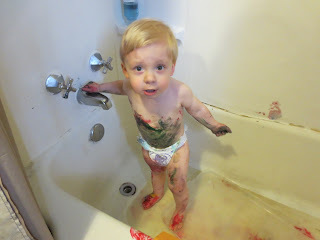 Every time we do bath I try to have something special to do - sometimes we have fizzy bath color tablets or we paint in the tub before the water is running or we find some toys that seem water safe and bring them to the tub. It's always an adventure! Next is reading time. We usually allow the little man to choose 2-4 books to read (the quantity depends on his level of exhaustion and our evening schedule). Either Heather or I read these books with A, talking about the pictures, asking questions, and engaging as much as possible with the content so that he gets more than just words on a page from us. We then move on to his Bible. We've used a number of kids Bibles since A was born, depending on his age (you can find a few we used here, here, here and here). Each had its strengths and weaknesses - some almost totally omit Jesus' death and resurrection, choosing instead to focus on the "classic" bible stories (David and Goliath, Noah and the Ark, etc). This is unfortunate, as no story is more central to their eternity or their spiritual growth than that of Jesus' sacrifice! Our very favorite Bible, and the one we are currently using, is the Jesus Storybook Bible (found here). I cannot express enough how much I like this one. Every single story ties directly to Jesus. When discussing OT stories, it goes out of its way to make mention of someone who will come that will save us from our sin. When I read through the stories of God's love for His people it describes His covenantal love as the "Never Stopping, Never Giving Up, Unbreaking, Always and Forever Love". It makes the stories emotional for me and I usually end our reading time with some tears in my eyes. I want A to know God's love - the full measure of grace and truth. Not just grace that doesn't recognize what God has commanded us to do for our own good and His glory. Not just truth that clouds our understanding that Jesus is the only one capable of atoning for our sin. And not a balance of the two, but full of both! Then we pray. We used to have one person pray and we would ask A if he wanted to pray. If he did, then we would coach him through a simple prayer, otherwise one of us would pray. We've switched methods (thanks to a great suggestion by Heather) and now we each pray a little - this gives him encouragement and makes him much more willing to participate. Lastly, we sing. One of us holds A and we sing together. We sing a modified version of "You Are My Sunshine" that takes out the "only sunshine" line and replaces it with his name (he isn't our only sunshine and he isn't the primary source of joy in our lives, that's reserved for Jesus). I love the blessing our little man is and I love his bedtime routine.